I was in 2 minds due to the 50/50 reviews but a friend encouraged me to get it so I did at that price. What is there to lose? 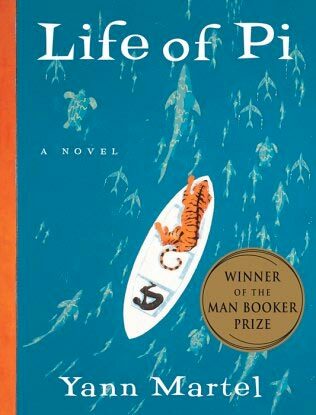 Life of Pi is a fantasy novel about a boy stranded in a lifeboat with a 450-pound Bengal Tiger after a shipwreck. Pi Patel's father runs a zoo in Pondicherry - a former French colony in India - but decides to migrate to Canada along with his family and assorted zoo animals due to political tensions. However, their voyage is abruptly cut short when Tsimtsum - their Japanese cargo ship - sinks in the Pacific during a violent storm. Pi manages to stay alive, but soon finds himself in a lifeboat with a tiger, hyena, orangutan and zebra. Will the laws of jungle reign in the ocean, or will Pi's ingenuity and will for survival beat all odds? This castaway's take on faith, philosophy and survival makes for a thoroughly riveting and thought-provoking read. The first part of this book is a cross between fiction (Pi's life) and non- fiction (all his random information about various topics he's introducing you too). It rambles on some but I quite enjoyed it and found the first quarter soon whizzed by. The 2nd part to me felt like the author suddenly lost interest as there was no build up to the ship wreck, it just went straight in to it like a hazy/ foggy night and continued in such a confusing manner. It wasn't bad but the problem for me is that it should have been half the length it was as nothing all that much happened except animals falling out....he stopped at an island and then continued on his way, there was no exciting rescue just a case of coming to the end of the line and things just kind of happened. This part I mostly skimmed/skipped as what you were reading 5 pages earlier is still happening so I didn't miss much. The 3rd part is Pi telling his adventure to some investigators and eating constantly. I was just relieved when the book was over which was disappointing as I enjoyed it to start with. I have noticed though the Man Booker Prize books I haven't enjoyed the few that I have read so I think I will stay far away from them in the future and read something worth reading. I wasn't sure about whether to give this 3 stars or 2 but in the end I decided a quarter of a book to read isn't worth the extra star. I'm glad I only paid 20p after all. I think its a marmite thing, some people like it some don't. Someone at work told me that they sat and read it in a day because it was so good. If you can get a cheap copy then it might be worth trying as you may enjoy it. I would have if the 2nd part wasn't so long.